What are the most popular online bachelor's degrees offered in Illinois? Illinois is part of the Midwestern-State Authorization Reciprocity Agreement, a program that allows students to access online and distance education courses across state lines. As part of the agreement, students can take online courses at public colleges in participating states while paying in-state tuition. The agreement also helps the Illinois Board of Higher Education in its effort to increase the percentage of adults in the state with a college degree. Of the 200 colleges and universities in Illinois, 75% of schools offer online and distance education opportunities. These schools provide students with a variety of programs, from career development and certification options to undergraduate and graduate level degrees. Students interested in an online program should be aware that not all official-sounding accreditation agencies are recognized by the U.S. Department of Education. The Illinois Board of Higher Education encourages students to vigilantly evaluate their target schools, and to ensure that they apply only to accredited colleges. Despite recent funding cuts in higher education across the nation, Illinois managed to increase state appropriations by over 10% in 2011 and 2012. Still, tuition has climbed steadily in the state. In response, students are increasingly attracted to online programs, where costs are generally lower. The University of Illinois at Urbana-Champaign is located in the twin cities of Champaign and Urbana and educates about 44,000 students through its 15 colleges and instructional units. Among the school’s notables are 23 Pulitzer Prize-winners (alumni and faculty), including Roger Ebert and George F. Will. The school has been a pioneer in innovative research in areas such as global sustainability and agriculture. It is also the home to one of the largest online colleges in Illinois, with more than 75 online degree, certificate, and endorsement programs. The institution offers an online bachelor of science (BS) in liberal arts and sciences for transfer students. The program, with concentrations in either society and environment or society in the Earth system, offers several areas of specialization, including sustainable business and sustainable societies. In addition, the institution has more than 800 online courses and 2.6 million Massive Open Online Course (MOOC) learners. USF offers a liberal arts education that integrates students’ immersion in a program of study with transformational experiences, including university ministry, service learning, and internships. USF’s practical, real-world curriculum is instilled in its 48 undergraduate majors, 38 undergraduate minors, and 19 graduate programs. Among the best online colleges in Illinois, USF offers more than 120 online courses, with 100% online degree programs at the baccalaureate level in business administration, RN-to-BSN, and healthcare leadership. The The RN-BSN degree completion program is a fast-track curriculum for registered nurses with an associate degree or diploma. All online students are given links with access to class content, assignments chat, discussions, and more. Students and faculty interact primarily through a discussion forum. A help desk is accessible 24/7 through email or phone. Part of the University of Illinois system, University of Illinois at Springfield is a public liberal arts school that serves around 5,400 students annually. UIS offers a wide selection of fully online degrees, including information systems security, healthcare informatics, political science, and liberal studies. Several bachelor’s and master’s degrees, certification and licensure programs, and graduate certificates can be completed entirely online. UIS maintains transfer agreements with several community colleges around the state. The school’s joint agreements connect community college students to UIS advisors, who can help them outline academic goals and devise a plan of study to make transferring easier. The 2+2 program allows community college students to begin earning credits toward a major before seamlessly transferring to UIS to complete an undergraduate degree. Choices for majors in the 2+2 program include accountancy, business administration, computer science, and management information systems. Based in Chicago, the Illinois Institute of Technology was an early proponent of distance learning, offering its first remote courses via live television broadcast in the 1970s. Today, IIT serves more than 7,000 students around the globe. IIT only offers online programs at the master’s level. Programs include general master’s degrees in computer science and biology as well as specialized degrees in electricity markets, biomedical imaging and signals, intellectual property management, and food process engineering. Online courses are delivered asynchronously and do not require you to attend set class times. However, online learners adhere to the academic campus calendar and are still responsible for completing assignments and other coursework by deadlines set by professors. Founded in 1944 as a Bible institute, LCU instills theological values into its curriculum to educate “a transformational community of global difference makers”. Approximately 1,000 students in undergraduate, graduate, and doctoral programs study areas as diverse as ministry and education to communication studies and organizational leadership in a 14:1 student-to-faculty ratio. Around 20% of LCU’s students complete their degrees from a distance. LCU offers 100% online bachelor’s degree programs in areas such as Bible studies, business administration, Christian ministry, and psychology. A program of note is the BA in intercultural studies, in which students complete a cross-cultural internship in locations across the United States, Africa, or South America. Whether taking classes online or on campus, students at LCU have access to affordable tuition and a suite of financial aid options. One of the premier Christian online colleges in Illinois, Moody Bible Institute offers online bachelor’s degrees in biblical studies, theology and cultural engagement, ministry leadership, and theological studies. Online learners can also earn an associate of bible studies or choose from three certificate programs in biblical leadership, biblical studies, or Christian spiritual formation. MBI offers multiple delivery options for online students to pursue an education with maximum flexibility, including conventional online courses, self-paced online courses, and blended on-campus and online courses. The school’s regular online courses use an eight-week format, with faculty supervision and weekly assignment due dates. Self-paced courses offer students 16 weeks to complete all assignments, an ideal choice for working professionals with varying schedules who cannot commit to weekly deadlines. Blended courses offer a mix of online and campus learning, combining the convenience of online learning with the face-to-face experiences of on-campus learning. DePaul’s Catholic, Vincentian, and urban identity distinguishes it from other institutions. A comprehensive university, DePaul’s curriculum of undergraduate and graduate programming covers the liberal arts and sciences in addition to specialized and professional programs. Among the school’s notables is a top game design program and one of the top film schools in the nation; overall, 90% of graduates of DePaul are employed, continuing education, or not seeking employment six months after graduation. One of the best online colleges in Illinois, DePaul has invested in distance learning over the years with award-winning training for online faculty, an online curriculum that is unique, and provision of the necessary digital learning tools to students. Several bachelor’s degree programs are offered online, including communications, computer science, and psychology. Of note is the BA in computing (BAC), designed for working adults with a competence-based curriculum in which students earn credit for college courses, work, and life experiences. A private Roman Catholic-affiliated college, Lewis University is one of the top online colleges in Illinois for working students, emphasizing professional experience and accelerated degrees. Lewis provides online bachelor’s, master’s, and one doctoral degree. Online bachelor’s degrees include computer science, information technology management, and organizational leadership. Several bachelor’s programs have an accelerated format for students with 30 transferable credits or more. Online master’s programs include aviation and transportation, data science, criminal justice, and public safety administration. Lewis also offers an online doctorate of nursing practice. For applicants with relevant professional experience, Lewis provides the Prior Learning Assessment program, which allows students to translate their work and life experiences into academic credit. Prior learning candidates have several options to demonstrate their knowledge, including portfolios of past work; standardized exams that test subject knowledge; and professional certifications, licenses, or other training. One of the oldest universities in Chicago, NLU’s curriculum is academically rigorous, progressive, and adult-centric. NLU offers more than 60 undergraduate and graduate degree programs through the National College of Education and the College of Professional Studies and Advancement. NLU’s points of pride include receiving more than $65 million in funding for applied research projects in areas such as school improvement and teacher preparation. Online bachelor’s degree programs are offered in applied communications, business administration, criminal justice, healthcare leadership, human services, and management information systems. The BS in healthcare leadership now has a concentration in long term care that can be taken online or in hybrid format; it consists of four courses and prepares students for licensing by the National Association of Long Term Care Administrator Boards. The BA in applied communications is notable because students have a concentration in entrepreneurship. An acclaimed research institution with 15 colleges, UIC’s 85 bachelor’s, 98 master’s, and 65 doctoral degree programs educate more than 29,000 students each year. Of note is UIC’s research into diverse areas such as cancer detection, wound healing, and climate change. UIC provides distance students with opportunities to study through a broad catalog of eLearning opportunities. Fifteen bachelor’s degree programs are offered 100% online at UIC, in fields such as English, business administration, and mathematical sciences. One of the best online colleges in Illinois, UIC offers bachelor’s degree completion programs in nursing and health information management. Of note is the BS degree in Earth, society, and environmental sustainability, in which students can specialize in several areas, including environmental informatics and sustainable societies. GU provides more than 1,200 students with a high-quality liberal arts education on its 50-acre campus located in Greenville and through online learning. Fifty undergraduate majors, adult, and graduate programs are available. Notably, 98% of students are employed within nine months of graduation, and students have access to hands-on experiences such as internships and networking opportunities at major corporations around the globe. Online learning at GU, one of the best online colleges in Illinois, involves a collaborative learning experience and support from highly respected faculty. Bachelor’s degrees are offered online in business administration, criminal justice, organizational leadership, and health psychology. To help students succeed, GU’s Student Success program provides academic coaching and an Academic Boot Camp. GU’s Jump Start program allows high school students to earn college credits toward a degree from a distance. Set amidst 750 acres of prairieland, GSU focuses on innovation and flexibility in delivering its curriculum to about 5,500 students. In addition to 64 undergraduate and graduate degree and 24 certificate programs, students have a rich on-campus life that includes more than 70 student clubs and organizations, the world-renowned Nathan Manilow Sculpture Park, and many opportunities for civic engagement. One of the online colleges in Illinois, GSU offers more than 120 online and hybrid classes each semester, in addition to two fully online degree programs: the BA in interdisciplinary studies and bachelor of science in nursing (BSN). The BA in interdisciplinary studies, which can be taken part time online, is notable because students can choose from 21 minors and earn credit for prior life experiences. Note that transferring to GSU is made easy because of the school’s dual degree program, a partnership with 17 Chicagoland community colleges. Through its four colleges, graduate school, and School of Continuing Education, EIU offers 51 undergraduate and 32 graduate degree programs to approximately 7,500 students. In addition to academic rigor and a faculty-to-student ratio of 1:14, students have access to online learning opportunities in several disciplines. One of the best online colleges in Illinois for students seeking a range of options, EIU offers bachelor’s programs that can be completed 100% online in general studies, psychology, organizational and professional development, and RN-to-BSN. The BA in general studies is a degree completion program with a childcare education option called the ABC/associate to bachelor's in childcare. Designed for adults 25 and older, the program is a cooperative effort between EIU and select community colleges around the state; it incorporates the study of academics with technological advances in the field. Established in 1899, Western Illinois University's traditional, residential campus is located in Macomb, with a non-residential metropolitan branch campus in Moline. WIU provides 66 undergraduate and 38 graduate degree programs, two doctorate degrees and 16 certificate programs to approximately 10,000 students. The school’s top majors are law enforcement and justice administration, biology, and agriculture. The school’s signature undergraduate degree programs include forensic chemistry, the first bachelor of fine arts (BFA) in musical theatre program at a public institution in the state, agriculture, engineering, supply chain management and more, including WIU’s law enforcement and justice administration program, which is the largest in the state and is recognized globally for excellence. One of the online colleges in Illinois, WIU offers a flexible BA in general studies (BGS), a BS in nursing completion program for nurses with an associate degree or a diploma in nursing, an MBA, an MS in instructional design and technology, and an MS.Ed in elementary education. There are also several online undergraduate minors, including fire administration, anthropology, management, women’s studies, computer-mediated communication, marketing, computer science, economics, and pre-MBA. The oldest college in Illinois, MCK has a tradition of graduates who have gone on to become pioneers in business and industry, politicians, and career public servants. The institution offers 48 majors, 37 minors, six graduate programs, and one doctorate program to about 3,000 students in small class sizes. MCK is one of the Illinois online colleges offering bachelor's degree programs designed by faculty and reviewed by their peers. Undergraduate degrees are offered through Blackboard online and are offered every eight weeks in the fields of nursing, business administration, and psychology. The online bachelor of business administration (BBA) has six majors, including business administration, accounting, and marketing. Each MCK online student has an advisor and access to tutoring and writing support services. MCK is among the state’s top universities for lifetime return-on-investment. A military friendly school, MCK has staff ready to address the needs of veteran and active military students. An evangelical Christian institution located in Elgin, Judson University infuses a Christian worldview into its curriculum of undergraduate and graduate degree programs in disciplines ranging from liberal arts and architecture to criminal justice and organizational leadership. With fewer than 1,300 students, Judson has a student-to-faculty ratio of 10:1. Several bachelor’s degrees can be taken online at Judson, one of the best online colleges in Illinois, including business administration, applied psychology, and human services. The BA in applied psychology is a faith-based major preparing students to apply psychological theories and methodologies in problem-solving human behavior challenges in a variety of occupational settings and fields. Judson is affordable, with 99% of students receiving some form of financial aid. All students at Judson have access to many internship and study abroad opportunities, high-tech facilities in which to conduct research, and it is a military friendly school. Aurora is a four-year, independent liberal institution dedicated to the “transformative power of learning.” The school has approximately 5,500 students who are exposed to academic rigor, award-winning faculty, hands-on learning options such as internships, and academic support programs. One of the online colleges in Illinois, AU offers distance learning that is flexible and convenient in a dynamic and interactive educational environment. Courses are offered year-round in five- to eight-week modules with many opportunities for student interaction with faculty and classmates via discussion boards and chat rooms. Online adult degree completion programs are offered in business administration, computer science, general studies, social work, RN-to-BSN, and criminal justice. Admission requirements for the online adult degree completion programs include two years of work experience and/or military service. AU has generous credit transfer opportunities for courses completed at regionally accredited institutions. One of the nation’s largest Jesuit, Catholic Universities, Loyola has a student body of approximately 16,000. The school delivers more than 80 undergraduate majors and 170 graduate, professional, and certificate programs through 11 schools and colleges. Undergraduate students have a 14:1 student-to-faculty ratio at Loyola’s four campuses and online. Loyola is one of the online colleges in Illinois offering 100% online degree completion programs; the fields covered are nursing, applied studies, psychology, criminal justice, information technology, and management. Notably, the BA in applied studies provides a strong foundation in communication and business, and allows students to focus on a discipline relevant to their professional world. All online learners have access to learner-centered courses, faculty specially training in the creation and delivery of online courses, and support in the use of distance learning. CUC is a comprehensive liberal arts university of the Lutheran Church-Missouri Synod, providing 100 degree programs in the arts & sciences, education, and business to approximately 5,600 students. Among Illinois online colleges, CUC is notable for its accelerated undergraduate degree programs. Adult learners can complete their bachelor’s degree 100% online in organizational management, sports and recreation, and management information systems. Students entering these online programs can earn up to 32 semester hours of credit for prior learning for experiences such as workshops, corporate training, and military training. The BA in organizational management, which prepares effective managers, is a pathway to CUC’s MBA. Overall, CUC has a dynamic community of online learners; 24/7 student access to assignments, books, And student discussions. The school is affordable, with 100% of full-time undergraduate students receiving financial aid. Based in the village of Bourbonnais, Olivet Nazarene University maintains regional education centers across the Midwest in Illinois, Indiana, and Michigan. The Christian liberal arts college serves around 5,000 students through campus and online programs, including several fully online degrees. At the undergraduate level, ONU offers three bachelor’s degrees: management, business administration, and RN-BSN nursing. Graduate students have a wider selection of options, including master’s degrees in pastoral leadership, education of English language learners, and curriculum and instruction. ONU also provides fully online reading, English as a second language and/or bilingual, and teacher leader endorsements for licensed Illinois teachers. All online programs use a cohort model that places students into groups, where they complete all courses in a sequence and collaborate together on projects. ONU’s programs typically blend synchronous and asynchronous course materials; students often attend one live, virtual meeting each week and complete remaining coursework asynchronously. Founded in 1957 as part of the Southern Illinois University system, Southern Illinois University-Edwardsville’s campus sits near the Missouri border. Ranked highly among public online colleges in Illinois, SIUE offers affordable online education for one flat tuition rate. SIEU offers two online undergraduate degrees: an accelerated RN-BSN nursing program and a bachelor of science in leadership in organizations (integrative studies). Graduate options include criminal justice policy, healthcare informatics, instructional technology, and physical education and coaching pedagogy. SIUE also offers an online doctorate of nursing practice and an online certificate in web-based learning. Most programs use an asynchronous delivery format with no designated login times. SIEU provides a wide selection of online student support services, including technical help, academic tutoring, library services, disability services, and counseling services. SIUE’s Tutoring Resource Center can pair online students with experienced tutors for their courses. Founded by Franciscan Friars in 1860, QU is a contemporary liberal arts university with a vibrant community of learners and educators. Some 92% of Quincy graduates find a job or enter graduate school within six months of graduation. Around 98% of students receive some sort of financial aid and 100% students are engaged in community service. Students have 40 undergraduate and four graduate degree programs to choose from, some of which can be taken through eLearning. Quincy is one of the Illinois online colleges offering degree completion programs that can be taken 100% online. Two baccalaureate programs are offered: a BBA and a bachelor of human services. Flexible learning and a supportive environment await online learners at Quincy, which uses Moodle to deliver its online courses. Inspired by the Catholic intellectual tradition, Ben U provides a learning environment that is dedicated to values such as scholarship and service, truth, and justice. A transformative educational experience awaits Ben U students, with 56 undergraduate and 24 graduate degree programs from which to choose. One of the best online colleges in Illinois, Ben U offers asynchronous online programs and courses in a number of disciplines. Undergraduate students can transfer up to 90 credits into either one of the school’s two online bachelor’s degree programs: the BA in management and the BA in organizational leadership. To help online students succeed, they participate in a complementary “success strategies” course -- a live simulation familiarizing them with the format. They also have 24/7 technical support and the flexibility to learn on demand. Founded in 1846 in Chicago, Saint Xavier University is the city’s oldest Catholic college and one of the top online schools in Illinois. Distance learners can pursue online degrees through both the School of Education and the School of Nursing, with certificates, bachelor’s, and master’s programs all available. SXU’s education programs include a master’s degree in elementary education, a graduate endorsement in ESL and bilingual education, and a certificate in educational technology integration. Nursing programs include an undergraduate RN-BSN, and a nursing master’s program with three concentration tracks: clinical leadership, executive leadership, and nurse educator. Students who possess a master’s degree in nursing can also pursue online certificates that can lead to certification as a clinical nurse leader or nurse educator. Most of SXU’s online programs require a practicum component, which can be completed at your place of employment or with a professional organization in your community. Ranked in the top 5% of U.S. schools for research, Southern Illinois University has received recognition from Forbes, the Carnegie Institute, Military Times, and the Latin American Scholarship Program of American Universities. The school offers 16 online bachelor’s programs in fields such as dental hygiene education, journalism, public safety management, mortuary science, and radiology management. Distance learners can complete all general education requirements online. SIU also offers 10 online master’s degrees, including architecture, health informatics, behavior analysis, and quality engineering and management. Distance learners can receive assistance from the online writing lab and library services. As a military-friendly school, SIU also offers courses on bases and air stations throughout the country. Non-degree-seeking students can enroll in one of the school’s online certificate programs, including animal nutrition, information system security, event planning, and mass communication. Students may also create a hybrid experience by taking some classes online and some classes through SIU’s campuses or centers. If you want to qualify for a range of high-paying job opportunities, earning a college degree is key. When deciding where and what you want to study, you may end up weighing both in-state and out-of-state schools. If you are from Illinois, there are many advantages to attending college in your home state. Sticking close to home can qualify you for in-state tuition and help you build a network of regional professional contacts. You may also benefit from your school's name recognition on the local job market, and you'll be relatively close by if you need to occasionally visit campus. When researching programs, be sure to consider our list of the most affordable online colleges in Illinois. All of the schools in this list are accredited, and our rankings highlight the colleges that offer the best blend of affordable tuition and return on investment. For over 14 years, the University of Illinois at Chicago has been offering distance education options through its Extended Campus. Students may choose from a variety of certificate and degree programs, including engineering, business administration, and applied health sciences. Online degrees are available at the bachelor’s, master’s, and doctoral level. UIC offers an online doctorate in public health leadership for experienced professionals who want to obtain top positions in their field. Tuition is a fixed rate for all online students regardless of residency status and financial aid is available. Last year, approximately two-thirds of students received scholarships or grants, making UIC one of the most affordable online colleges in Illinois. Located in University Park, Governors State University has a robust distance education program, offering over 120 online courses every semester. Students can pursue a fully online education in areas like supply chain management and addiction studies; or they can integrate on-campus coursework to create a hybrid learning experience. Distance learners enjoy access to the same resources as their traditional peers, including 24/7 technology support, study abroad opportunities, and professional development assistance through Career Services. As one of the most affordable online colleges in Illinois, GSU provides low tuition rates and financial assistance. National Louis University enrolls over 8,000 students annually through its campus and distance education programs. NLU provides online bachelor’s and master’s degrees in fields like industrial and organizational psychology, nonprofit management, and early childhood administration. Classes are facilitated through the Desire2Learn platform. Distance learners earn the exact same diploma as their on-campus peers. Online students can also receive a number of academic support services, including video conference tutoring and online professional development via webinars. Though NLU’s tuition rates don’t change based on where a student lives, they are dependent on degree type and enrollment status. The University of Illinois at Urbana-Champaign offers an impressive catalog of distance education pathways, including massive online open courses (MOOCs) used for professional skill development and fully accredited degree programs. Currently, the university offers one online bachelor’s degree in environmental sustainability. Graduate and doctoral candidates will find numerous program options, including bioengineering and educational diversity. The university’s tuition rates are based on individual program. Online students have access to scholarships and grants. Online students can receive support services, including distance library services, tutoring, and exceptional support for military students. With a mission grounded in inclusivity, Aurora University prides itself on its online learning programs, which range from fully accredited undergraduate and graduate degrees to a post-degree endorsement in bilingual/ESL teaching. Degree options include homeland security, nonprofit leadership, and mathematics education. Registered nurses who want to earn their bachelor of science degree can enroll in the online RN to BSN. Aurora’s online tuition rates are low and roughly 98% of its students receive financial aid, making it one of the most affordable online colleges in Illinois. Distance learners also enjoy services like one-on-one advising and tutoring through the Academic Success Center. Though its main campus is located in Joliet, the University of St. Francis annually enrolls nearly 4,000 students from across the world through its numerous online degree programs. USF’s online bachelor’s programs center on business administration with concentrations in areas like entrepreneurship and logistics management. Students who want to pursue a master’s or doctoral degree will find more variety, including programs in nursing administration, professional training development, and educational leadership. Like their on campus peers, distance learners may join student clubs and honor societies as well as access academic and career services. Students are eligible for ample financial aid opportunities. DePaul University regularly receives praise for student diversity and the quality of its academic programs and support services. Students may choose to mix online classes into their campus learning experience or can pursue fully online degree programs. Some online degrees include a bachelor of science in information technology and a master of arts in educational leadership. DePaul awards more than $26 million in scholarships each year, making it a stand-out choice among affordable Illinois universities. Located in Charleston, Eastern Illinois University provides accessible and career-centered educational programs. Students can choose undergraduate and graduate level degrees in fields like organizational development, nursing, and business administration. Distance learners pay the in-state tuition rate, which, when combined with numerous forms of financial assistance EIU provides, makes it one of the most affordable online colleges in Illinois. The university also encourages civic engagement and professional development for all students through volunteer and study abroad opportunities. Benedictine University offers over 110 academic programs, many of which are accessible to distance learners through the School of Graduate, Adult, and Professional Education. Undergraduate students have two online degree options in management or organizational leadership. Those pursuing a graduate degree have more options to choose from, including several dual degree programs. Tuition is priced per credit, based on degree and program type. Online students can access financial aid, including military benefits and corporate discounts. Founded in 1828, McKendree University stands as Illinois’ oldest institution of higher education. The school draws upon its rich history of academic excellence in both its online and on campus degree programs. Nearly 97% of its students enter a master’s program or gain employment within six months of graduation. McKendree offers several online degree (and dual degree) options in fields like human resource management, criminal justice, and education. Postgraduate students can earn a doctor of nursing practice online. With a maximum online class size of 20, access to academic mentoring and career development support, and affordable tuition, McKendree is one of the best online colleges in Illinois. Founded in 1870, Loyola University Chicago is a private institution rooted in the Jesuit ideals of community service and accessible education for all. LUC currently offers seven online bachelor’s degrees, 10 online master’s degrees, and several online certificates. Programs include information technology, nursing, and criminal justice. LUC boasts a generous transfer policy, allowing students to earn up to 64 degree credits from previous work at accredited colleges. Distance learners can access learning support through the Center for Tutoring and Academic Excellence. In terms of the sheer quantity of degree offerings, Concordia University is one of the best online colleges in Illinois. CUC offers eight accelerated undergraduate programs in areas like management information systems and kinesiology, as well as a wide range of master’s and doctoral degree opportunities. Students take one eight-week course at a time in a predetermined sequence, allowing them to fully engage with the material while also allowing the freedom for work or other responsibilities. CUC’s costs are reasonable and the school offers a price guarantee: as long as a student pursues their degree without interruption, their tuition rate won’t increase. Quincy University combines the interdisciplinary approach of a liberal arts education with the skills acquisition of dedicated research institutions. Distance learners can complete one of four online degrees: an undergraduate human services program, a graduate communication program, and undergraduate and business administration programs. Quincy’s tuition varies based on program level and type, with degree completion students receiving the lowest rates. Distance learners have access to financial assistance, including need-based grants for state residents and scholarships for transfer students. Quincy also provides tools for independent research, internships, and study abroad opportunities, making it one of the best colleges in Illinois for professional development. Courses are delivered through Moodle. Located in Bourbonnais, Olivet Nazarene University’s distance education programs are designed for working professionals and students with prior college experience. Potential students who wish to pursue one of the accelerated undergraduate programs must hold an associate degree. Olivet also offers a number of graduate degree options in areas like business administration, nursing, education, and organizational leadership. Online programs last two years and follow a cohort model, enabling students to build lasting relationships with their professors and peers. Olivet is one of the most affordable online colleges in Illinois for out-of-state students, with distance learners paying a fixed per-credit tuition regardless of their residency status. Western Illinois University offers a variety of distance learning opportunities, including a bachelor’s degree in general studies, several graduate-level programs, and professional training for firefighters. Students already enrolled at WIU may also choose from a catalog of individual online classes to supplement their on campus education. WIU routinely receives praise as one of the most affordable online colleges in Illinois. All US residents pay the same fixed tuition rate and may access the school’s financial aid tools. Online students also utilize learning resources like personal advising and tutoring through the WIU Writing Center. Located in Dekalb, Northern Illinois University provides distance learning opportunities through online classes and state-of-the-art Outreach Centers. NIU offers undergraduate and graduate degrees in business, engineering, nursing, teaching, and information sciences. Experienced professionals that already have degrees can take advantage of NIU’s continuing professional education, including courses in project management, human resources, and facilities management. State residents can take advantage of the Truth-In-Tuition program, which guarantees students the same flat tuition rate for four years. Judson University has a robust distance education initiative that offers flexible individual classes and complete online degree programs. Students can choose from undergraduate programs in fields like applied psychology, human services, and organizational leadership. Graduate options include business administration and leadership in ministry, the latter of which requires students to attend weekend residencies on campus for practicum experiences. Online students can take advantage of Judson’s study abroad and conference opportunities. Online students also have access to the school’s other academic and career resources, such as video tutoring and membership in the Honors Program. Judson’s tuition rates are the same for all students regardless of residency status, making it one of the best online colleges in Illinois for out-of-state students. Roosevelt University launched its first online classes in 2001; today, the school offers a large catalog of courses to supplement on campus learning. RU also offers online certificate and degree programs for distance learners. Undergraduate students can choose from majors like criminal justice and sustainability studies, while those pursuing their master’s have options in areas like organizational development and tourism management. While most classes are offered asynchronously through Blackboard, there are also options for students who wish to watch lectures in real time or complete a hybrid program. Roosevelt stands out among other colleges in Illinois for its dedication to providing all online students with real world experiences such as internships, mentorships, study abroad trips, and career development opportunities. Greenville University regularly garners praise as one of the best online colleges in Illinois for the breadth of its distance education offerings and the excellence of its student support network. Online students can choose from undergraduate programs like health psychology and criminal justice administration as well as graduate programs like business management and education curriculum. Current high school students can jumpstart their college education by dual enrolling in online coursework at a greatly discounted tuition rate. All students have access to financial aid and services such as academic advising and service-learning trips abroad. Online students can gain professional development through membership in organizations like the University Honors Program. Located in Deerfield, Trinity International University offers comprehensive distance education options for students who want to supplement their on campus work with online classes or those who wish to earn their entire degree remotely. Undergraduate options include programs in business, criminal justice, psychology, and Christian ministries. TIU also offers a master of arts in bioethics for experienced professionals. Tuition rates are the same for all students regardless of where they live. Online students are eligible for financial aid. Tuition in Illinois has increased in recent years. In-state tuition in public 4-year schools jumped by 22.7% between 2008 and 2014, while state funding for higher education decreased by nearly 15% in that time. In response, college students have increasingly turned to online programs, where tuition and auxiliary costs are much lower. 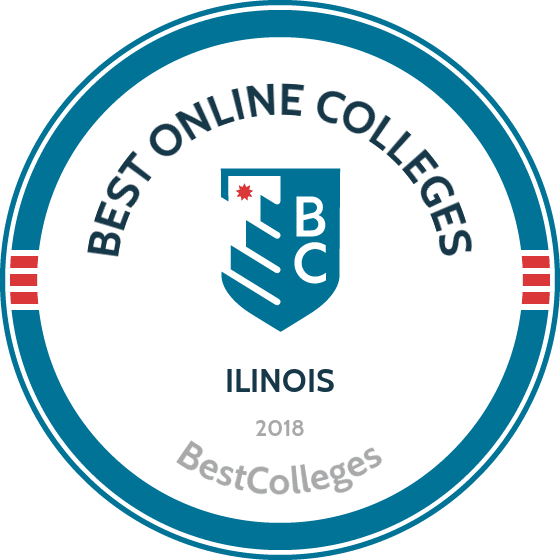 Browse our list of the best online colleges in Illinois for more insight into distance learning programs in this state. All 48 Illinois community colleges offer online classes, and additional online education opportunities are sprouting across Illinois' accredited universities. The state's acceptance into the Midwestern State Authorization Reciprocity Agreement will further enhance online opportunities in the state. The agreement is a national initiative that makes higher education more accessible to people across state lines through online programs. The initiative, funded by a $3 million dollar grant, affords Illinois students access to online courses and degrees available in partnered states, improving the quality and breadth of the state's online education programs. With rigorous, affordable online programs offering marketable degrees, more students will have access to higher education. This will allow students to complete degrees on their own timeline, helping them transition into the career they've always wanted. Standing at the forefront of the online education movement, Illinois' colleges and universities are well-positioned to provide a range of educational opportunities to students for years to come. In Illinois, employment growth in this profession is strong. According to the Illinois Department of Employment Security, long term projections show an increase of 15% in the total number of jobs between 2014 and 2024. Wages increased by 6% from 2011-2016. In Illinois, what were the top careers in 2016 for people who had a degree in Registered Nursing? Data source: Illinois Department of Employment Security, Bureau of Labor Statistics. Data may not be available for every year. Employment growth in this profession in Illinois is moderate. According to the Illinois Department of Employment Security, long term projections show an increase of 11% in the total number of jobs between 2014 and 2024. Wages increased by 7% from 2011-2016. What were the top careers in Illinois in 2016 for people who had a degree in business administration and management? In Illinois, employment growth in this profession is moderate. According to the Illinois Department of Employment Security, long term projections show an increase of 7% in the total number of jobs between 2014 and 2024. Wages remained relatively stable from 2011-2016. What were the top careers in Illinois in 2016 for people who had a degree in criminal justice/safety studies? In Illinois, employment growth in this profession is moderate. According to the Illinois Department of Employment Security, long term projections show an increase of 11% in the total number of jobs between 2014 and 2024. Wages increased by 8% from 2011-2016. What were the top careers in Illinois in 2016 for people who had a degree in health/health care administration/management? Employment growth in this profession in Illinois is unavailable. According to the Illinois Department of Employment Security, long term projections show an increase of 11% in the total number of jobs between 2014 and 2024. Wages remained relatively stable from 2011-2016. In Illinois, what were the top careers in 2016 for people who had a degree in liberal arts and sciences/liberal studies?